Over the course of 17 months, President Donald Trump has battled with courts across the nation, attempting to impose his travel ban. Now, the president’s fight to issue his controversial order has come to an end. Last week, the Supreme Court made a decision to uphold President Trump’s travel ban, which means that the issuance of immigrant and non-immigrant visas will be indefinitely suspended for individuals from several predominantly Muslim countries—namely Iran, Libya, Somalia, Syria, and Yemen. This policy delivers a major political win for the president, who has made the travel ban a top priority since the very beginning of his presidential campaign. Here is a brief history of President Trump’s travel ban. Due process is a Constitutional right that comes from the Fifth and Fourteenth Amendments. The Fifth Amendment applies to the federal government, while the Fourteenth Amendment applies to state and local government. The Fifth Amendment protects an individual from being held for committing a crime unless they have been indicted correctly by the police. 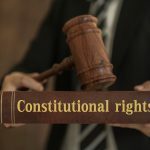 The Fourteenth Amendment clearly says that no state can “deprive any person of their life, liberty, or property without due process of law.” In other words, the state cannot deprive individuals of basic rights without first allowing for the proper legal proceedings. President Donald Trump issues an executive order, temporarily suspending travel from Iraq, Iran, Libya, Somalia, Sudan, and Yemen for 90 days and blocking refugees for 120 days. A few days later, agents from the Department of Homeland Security block travelers from these countries from entering the U.S., leading to Muslim ban protests and the beginning stages of legal action. Federal District Court Judge James Robart sends out a nationwide restraining order blocking the policy from being implemented, which provides short-term relief for hundreds of people initially affected by the ban. A week later, The U.S. Court of Appeals for the 9th Circuit refuses to reinstate the ban, stating that it violates due process rights. President Trump issues a revised travel ban targeting only six countries and exempting visa- and green card-holders in an attempt to appease the courts. Shortly after, Federal District Judge Derrick Watson issues a nationwide halt to the revised travel ban. Next, Maryland Federal Distict Judge Theodore Chuang partially blocks the travel ban on the basis of “religious discrimination against Muslims.” The U.S. Court of Appeals for the 4th Circuit upholds the ruling from Maryland. The Supreme Court upholds certain parts of the ban. 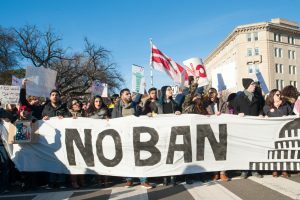 Meanwhile, travelers with visas are obligated to prove their connection to a U.S. organization or individual in order to steer clear of the ban. President Trump sends out his third version of the travel ban, which includes indefinite bans for individuals from Iran, Libya, Somalia, Syria, Yemen, Chad, North Korea, and Venezuela. (Chad, however, was recently dropped from this list). The Supreme Court rules that the ban can take full effect while legal challenges continue in federal appeals courts. As a response, a three-judge panel of the 9th Circuit appeals court rulings against the ban. The Supreme Court agrees to hear the Justice Department’s appeal of the 9th Circuit ruling, leading to multiple oral arguments. The Supreme Court hears oral arguments on the appeal of the 9th Circuit ruling. The Supreme Court upholds President Trump’s travel ban, stating that the president has the authority to execute such an immigration ban on the basis of national security. Those who opposed the ban compared it to the 1944 Korematsu v. United States decision, which endorsed the use of Japanese internment camps during World War II.